The classic Christmas poem is spiced up using LEGO scenes as illustrations. You're not going to want to pack it away once the season is past. What could be a more perfect pairing than the classic Christmas rhyme and everyone’s favorite building brick? If you’re the type to celebrate the Christmas holidays, chances are you’ve heard the classic Clement C. Moore poem, The Night Before Christmas, one or two (or a thousand) times. Regardless of how many times we’ve heard it before, reading through it during the Christmas season is a treasured tradition for my family – but let’s face it, it doesn’t hurt to spice things up once in awhile. The poem is just perfect as is, but you’ve probably been looking at the same illustrations for years. Of course, there hasn’t exactly been tons of options for quirky families to find a Night Before Christmas that fits – but now there’s a version that make kids and adults alike happy – LEGO. Seriously – who doesn’t love LEGOS? Every pile is full of potential, really brings out the creativity in everyone, and they’re one of the few toys you never have to grow out of. 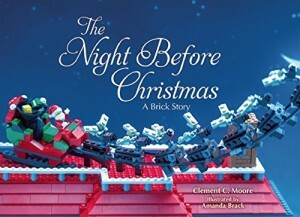 In The Night Before Christmas: A Brick Story, each of the iconic scenes mentioned in the poem is illustrated completely with LEGO building blocks, and the level of detail is what really makes it shine. Kids will find both tons of ideas and lots to look at as they search each page for all the little things you miss the first time you read it. It was an instant hit with our seven and nine year old testers (and their adult reader was pretty impressed as well). I like that the holiday classic was given an update without actually changing what’s so great about the original. 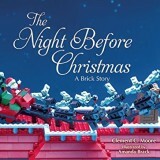 The Night Before Christmas: A Brick Story offers the classic Clement C. Moore poem as you know and love it, but illustrated in a whole new way. Each scene is portrayed entirely with LEGO bricks, and it provides both a fun way to look at the classic, and tons of ideas for your own building sessions. It’s the perfect way to spice up your holiday traditions this year – why not continue the LEGO theme by challenging your family to come up with their best decorations using the bricks?